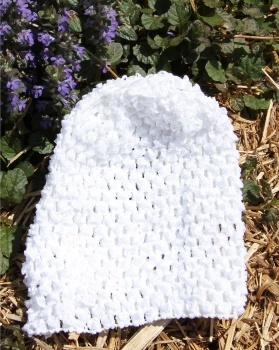 This is an adorable white infant waffle beanie that will dress up your Baby Girl for any occasion. These hats not only look great, but will also help keep her head warm on your outings. This is a bright white and will match any color and outfit. Add on any of the Daisy Flowers or smaller bows, all of these come on their own alligator clip and will easily slide right into the side of the waffle openings. This option will change the whole look of your white beanie instantly.